A greenhouse gas (GHG) is any gas in the atmosphere that absorbs and emits radiation in the thermal infrared range. These are the fundamental cause of the greenhouse effect, which results in increased temperatures on Earth. The greenhouse effect occurs as the gases reach Earth’s surface. As the short wave energy heats the surface, some of the longer wave energy radiates back into the atmosphere and back into space. Greenhouse gases absorb some of the energy and trap it in the lower atmosphere. Less heat radiates into space, and Earth is warmer. Many greenhouse gases occur naturally. Carbon dioxide, methane, water vapor, and nitrous oxide are naturally present in Earth's atmosphere. Others, such as chorofluorocarbons (CFCs), hydrofluorocarbons (HFCs), perfluorocarbons (PFCs), and sulfur hexafluoride (SF6), are human made. Because of the Industrial Revolution atmospheric greenhouse gas concentrations have been rising over the last few centuries. Increasing population and dependence on fossil fuels for energy have resulted in a sharp rise in GHG emissions. While some GHGs do occur naturally, other human activity has interfered with the natural cycles that can moderate the effect of the increasing emissions. Read about the characteristics and implications of some of the major greenhouse gases below. Use the Related Links and other resources in this module to investigate other greenhouse gases and their effects on global climate. Water vapor is the most abundant greenhouse gas in Earth’s atmosphere. Changes in the concentration of water vapor in our atmosphere are not attributed directly to industrialization but to climate feedbacks related to climate warming. Although the water cycle is well understood, feedback loops connecting the water cycle and climate changes are still poorly understood for the most part. Carbon dioxide is perhaps the most widely studied greenhouse gas. Dr. Charles Keeling, an American scientist, began recording atmospheric carbon dioxide measurements at the Mauna Loa Observatory in 1958. His studies were the first to warn the world of the anthropogenic (human-caused) contributions to global warming. The famous “Keeling Curve,” a result of his extended studies, measured the ongoing buildup of carbon dioxide in Earth’s atmosphere. Keeling's data also showed a strong seasonal variation in carbon dioxide levels. Peak levels occur in late winter in the Northern Hemisphere. Lowest levels occur in spring and early summer. Notice that the variations can be explained by considering what is happening to plant growth during those times. Plant growth in spring and early summer reduces atmospheric CO2 through the process of photosynthesis; during winter plants cannot have the same mediating effects, and atmospheric CO2 rises. Image source: Image create by Robert A. Rohde. Read more about this image in the Featured Data Area. Other processes affect CO2 concentrations. Geologic (rocks, soil) and hydrologic (water) processes and cycles also affect both the emission and uptake of carbon dioxide from Earth’s environment. Anthropogenic processes have altered the natural balance mechanisms. 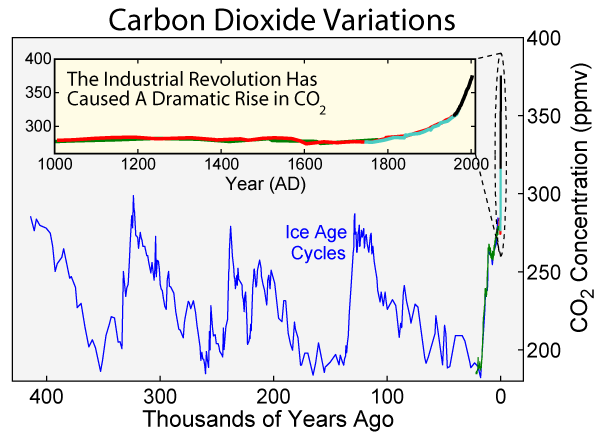 Referring to the CO2 graphs placed above and below this text, you can see that CO2 concentrations were fairly stable at 280 ppm (parts per million) before the Industrial Revolution. Now, they hover around 370 ppm and more. Data is obtained from atmospheric samples contained in ice cores and from more recent direct measurements. Source: NOAA graph at http://climate.nasa.gov/evidence/. Methane is released into the atmosphere by both natural and anthropogenic sources. It is released in low oxygen environments such as swamps and bogs and through the roots of some plants. Anthropogenic sources have increased methane emissions through increased use of natural gas and through mining. Direct measurement of methane in the atmosphere began in the late 1970s. Concentrations were shown to increase slowly with fluctuations until 1990. It is unclear why there has been little sustained increase since then. Ozone is formed through reaction of ultraviolet radiation and oxygen in the stratosphere. A small portion of this “ozone layer” falls through the atmospheric layers to Earth's surface. The layer of air next to the surface is the troposphere. In recent years the ozone in the troposphere has been increased through irradiation of emission particles from cars and pollution from factories. Ozone contributes greatly to photochemical smog concentrations in many urban areas. According to some research, concentrations of trophospheric ozone have risen by 30% since the Industrial Revolution. The Intergovernmental Panel of Climate Change regards it as the third most important greenhouse gas (after carbon dioxide and methane). Nitrous oxide is produced by microbial (bacterial) processes in soil and water. The use of fertilizers with nitrogen and some industrial processes also contribute to atmospheric N2O. Chlorofluorocarbons (CFCs) are human made gases used as refrigerants, aerosol propellants, and cleaning solutions. They can destroy stratospheric ozone, and a global effort to stop their production has been very successful. Levels of some of the major CFCs are now declining. Because of their long atmospheric lifetimes, some concentrations will stay in the atmosphere for more than 100 years. They comprise quite a few of the synthetic gases known to be greenhouse gases—gases capable of increasing Earth’s temperatures. Other synthetic gases such as CF4 (carbontetrafluoride), SF6 (sulfurhexafluoride), and the hydrofluorocarbons (HFCs) are also problematic for mitigating effects of greenhouse gases. Source: IPCC 4th Assessment Report: Climate Change 2007: Synthesis Report. Although not greenhouse gases, aerosols can have an effect on climate temperatures. Aerosols are small particles in the atmosphere from smoke, dust, industry, and other sources. Aerosols can absorb and scatter radiation. This causes either warming OR cooling, depending on the aerosol. Aerosols are also important in the formation of clouds and can therefore affect the water cycle and precipitation. Of course, some mechanisms are accepted. As temperatures in the atmosphere increase, evaporation of water increases. Evaporation increases at all water reservoir sites—groundwater, rivers, streams, oceans, soils. Because the air is warm, the water can hold more moisture. The increased amounts of water vapor in the atmosphere can then absorb more thermal energy radiated from Earth, and this further warms the atmosphere. (This is called a positive feedback loop because the effect increases with each part of the cycle.) The water vapor eventually condenses and forms clouds. Clouds can reflect some solar radiation, resultsing in a cooling effect. How much of a cooling effect this can have varies and difficult to measure accurately.